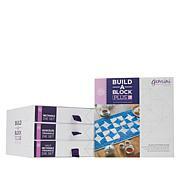 The perfect companion for all your patchwork projects! No need to worry about measurements ... these dies ensure an accurate 1/4" seam allowance and the cut pieces are exactly the same size each time. Cut through multiple layers of fabric in one movement saving time and effort to allow you to focus on the pleasures of sewing. 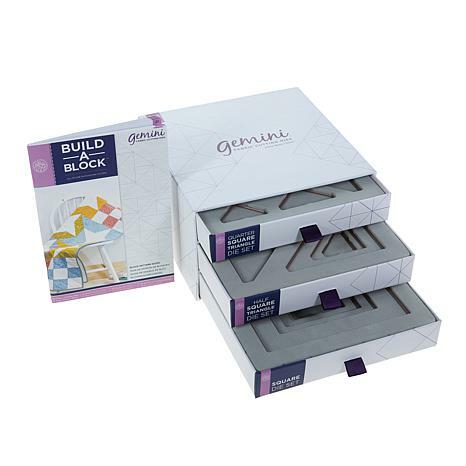 Clear instructions and a block guide are also included with the pack that covers 20 block patterns, and there's an additional 60 block patterns available online. All dies available in 1.5", 2", 2.5", 3.5", 4.5", 6.5"
Oh my Goodness!! The cutters are nothing short of awesome! Such a times saver. Great for any quilter, weather they be a newbie or a pro. I love them. 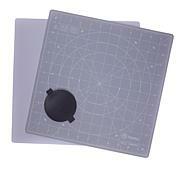 This is an excellent product, these dies cut out beautifully. Highly recommend these dies for a new quilter or someone who doesn't want to measure, use a rotary cutter, etc. Would definitely in the future purchase more, hope more quilting dies arrive from Crafter's Companion soon. Thanks HSN for another great product.. These dies are great! 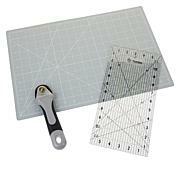 I was able to cut 130 squares and half square triangles in about 45 minutes with my Gemini Junior and the dies; way faster than I'd ever be able to use a rotary blade! The dies consistently cut through 8 layers of quilting cotton fabric. Best of all, perfect shapes every time! I love this product. Making a quilt is so easy. I don't have to spend days cutting the fabric. All I have to do is buy yards of fabric instead of the squares. The dies cut the fabric in such a way where I don't have to worry if it will be put together accurately. It easy to use. I cut my hand twice with the rotary cutter and this in the perfect gift for me. Not more rotary cutter cut my hand. Yea!Keep make it more of this. I like it so much.